Johanna Whitney throws away her talent to marry a brilliant film director, only to watch him crash and burn in SAPPHIRE AND SHADOW. In CHOICES, Shanna Brady, daughter of wealth and influence, struggles to find true love after being humiliated and cast aside by her husband. In FLASH AND FIRE, Amanda Foster, child of privilege, vows to make it on her own as a TV anchor despite the dangerous and crippling jealousy ignited against her in the newsroom. 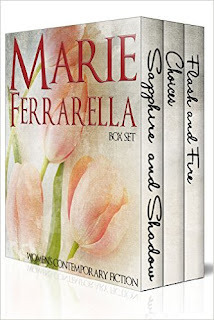 Beloved USA Today and Publisher's Weekly bestselling author Marie Ferrarella is now re-releasing these hard-to-find women's contemporary novels written in the tradition of Danielle Steel, Nora Roberts and Debbie Macomber. 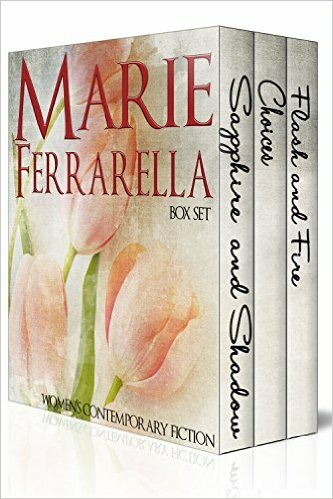 Marie's unique touch, filled with empathy and wry humor, enhances these heart-tugging stories exploring the tangled emotional lives of modern women. This title needs reviews! Be the first to leave feedback!